Our own Youth League Sales Manager, Tom Waters, threw out the first pitch at the May 29, 2013 Louisville Bats game versus the Columbus Clippers. From what we know about Tom it is no surprise he strode to the mound with confidence and fired a strike down the middle! The May issues of our OnDeck Newsletter are available for your reading pleasure. Great articles by Dave Hudgens and Tony Earp highlight the baseball and soccer editions respectively. You probably all saw the horrific photograph of Boston Marathon bombing victim Jeff Bauman being pushed from the scene of the explosion by Carlos Arredondo, (the hero in the cowboy hat). Last night, the Boston Red Sox and Major League Baseball honored them by having them throw out the first pitch at Fenway park. The ear-to-ear smile from Jeff and the perfect strike he throws are worth watching. For anyone who needed another reason to like and respect the classy Peyton Manning, the L.A. Times’ Sam Farmer writes of the quarterback’s penchant for sending letters to retiring players, and the reasons he cites for the unusual practice. 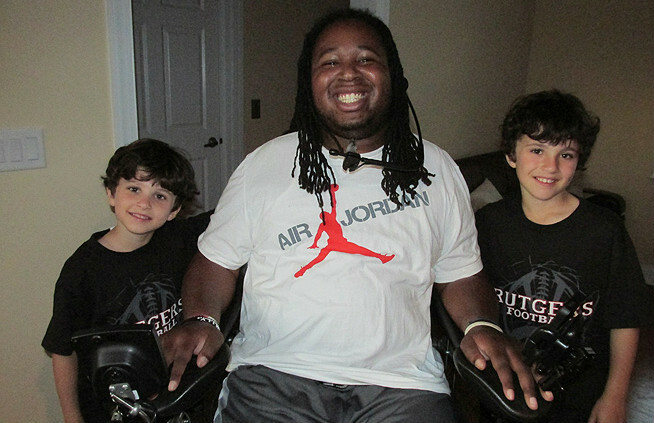 Yesterday, we told you about Eric LeGrand, the Rutgers football player who was paralyzed during a game. To help with the immense costs of his rehabilitation, he is hosting his third annual Walk To Believe on June 15 at the High Point Solutions Stadium in Piscataway, N.J. You can learn more about this event or donate by visiting awalktobelieve.org. Remember Eric LeGrand, the Rutgers football player paralyzed from the neck down during a game against Army in 2010? SI’s Seth Davis took his sons to Eric’s house to meet him. The rest of us can learn from the way this young man is handling the life-changing setback he was dealt. The spring baseball and soccer campaigns are coming to a close. That means team parties, trophies, gifts for coaches and team parents, end-of-season tournaments and equipment returns. It also means you might have some kids who have played all season without getting the recognition or praise they’d hoped to receive. Or they may have wished to play a position and not yet had the opportunity. And this is your last chance to make it happen. Go down your roster and look at each player, one-by-one. Can you remember the last time you called out loud, so all your team and parents heard it, something every player did well during a game? Do you recall the last time each kid was made to feel special at practice in front of his teammates? If not, there’s still time to give a boost to the youngsters who maybe didn’t score a lot of goals or runs; who were never MVP of a game. The praise doesn’t have to be over-the-top, insincere flattery – in fact it shouldn’t be. Kids can pick up on that and it may have the opposite of the intended effect. But something simple, said so that everyone hears it: “What a great pass”, “Best swing all year”, etc. may be enough to make a young boy or girl who was thinking about giving up the sport, come back for another year. Allowing a youngster pitch or get on the gear and catch an inning, play striker or goalie – this might be all it takes to get them re-enthused and excited to sign up again next time. And that is your primary mission as a coach. In youth, recreational sports, coaches could very legitimately be evaluated on this sole criteria: The percentage of players on your roster who come back to play again next season. So give a literal “shout-out” to the kids on your team who haven’t had much glory. Take a youngster aside, put your arm around him or her and tell them how much you enjoyed coaching them this year and that you hope to have a chance to do it again. Recognize someone during the post-game meeting for something small but positive they did for the team with a round of applause. And put some players in at positions that they’ve longed to play. You’d sure like to hear your team’s parents thank you and tell you that you did a great job this year. The kids on your team want the same thing, ten times more. Make it a point to make their day before they take off the uniform for the last time.